The Makino MMC-R automation system provides automated robotic fixture-plate distribution in 4- and 5-axis horizontal and vertical machining centers. This new automation system is perfectly suited for high-product-mix, low-volume production runs, enabling manufacturers to increase spindle utilization and reduce setup times through accurate and reliable machine loading, unloading and part storage. The MMC-R is designed for flexibility, accommodating a wide variety of customized configurations for simple shop-floor integration and improved utilization of capital assets. 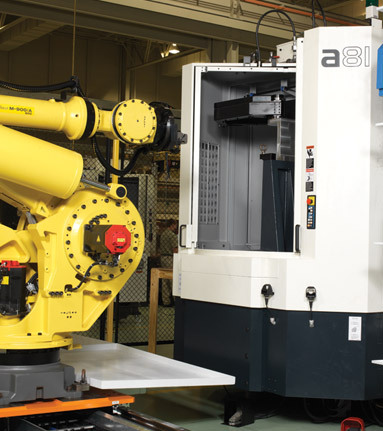 These systems are typically composed of 4- and/or 5-axis horizontal and vertical machining centers, a 6-axis robot transport, work-setting station(s), fixture-plate storage rack(s) and fixture plates. An optional 7th-axis floor track can be integrated into the MMC-R to support additional machining and storage capacities. The MMC-R offers fixture-plate distribution for both 4- and 5-axis machining centers for flexible, automated production. Fixture plates are designed with a steel construction and are available in a variety of sizes, based on machine size, 4- or 5-axis machining, and robot specifications. Delphin interfaces provide secure fixture-plate transfer between the robot gripper and the machine tombstone for accurate and repeatable part production. By transporting fixture plates in place of a complete machine pallet, manufacturers benefit from reduced part fixture costs. The MMC-R can incorporate Makino’s MAS-A5 cell controller for coordinated production schedules of fixture-plate transfers, allowing increased manufacturing efficiency through reduced machine downtime. The MMC-R cell controller monitors the conditions of the robot transport and issues transfer tasks to the robot. A human machine interface (HMI) is included for initial setup and alarm/event messaging to ensure in-progress production security. Makino Integration Services provide complete integration of machining technologies, automation, third-party equipment, application engineering, fixture design, on-time delivery, on-site installation, successful test runs, in-shop training, online training and post-production support. The engineering staff understands machine tools from the inside out, including third-party tool measurement, part measurement, vision systems, pallet systems, form control, remote machining and machine tending. Integrating these automation components to their full potential, based on a shop’s unique demands, can greatly increase overall efficiency. For more information, call (800) 552-3288, or visit Makino at makino.com/engineering.